I have had a few people contact me eager to get started with training for a triathlon using their new Apple Watch. It's great to hear from everyone, and great to know they have somehow found my blog deep among the valleys of the Interwebs. So here is my intro to getting started with Triathlons using Apple Watch. For anyone planning to complete an event and in particular targeting a time, I'd recommend buying or creating a structured training plan, or if you really want to smash that target think about taking on a coach. You can of course take it on a "just do what I feel like each day", or a "2 swims, 2 runs, 2 bikes a week" approach but if you're like me, if I give myself wiggle room I'll take it (and always in favour of doing less) so a plan keeps me honest. And a structured plan will concentrate on the right sort of targets at the right time of the plan (e.g Periodization, - I like Trainer Road's approach to this which you can read about here, though there are all sorts of variations). Well it's what I'd look for. Sorry for being a bit presumptive. It matches your event and current fitness level (as far as you can ascertain), and how much time you have before the big day. Personally 12 weeks would be the minimum for me, and for my IronMan Wales I've started 10 months in advance. When you scan through the plan (or a sample) the workouts look realistic and understandable for you, and use the tech you have. e.g. It uses HR zones which you can use with your Apple Watch (rather than Perceived Exertion (PE)) or power zones if you have a power meter on your bike. You can post your workouts onto a platform that enables you to keep track of your progress and/or share with a coach, or provide some motivation by comparing with others. Point 3 is not fully realised yet in a single app I'm afraid, but you can use a combination of the Apple workout app, third party apps, and iPhone apps to get what you need, as detailed below. Trainer Road. If you plan on doing indoor training on your bike with a smart trainer, then this was my favourite tool as I trained for my first IronMan in 2017. Their training plans are comprehensive and include swim and run as well as bike, and plans for Sprint, Olympic, Half and Full Distance events, with phases for Base, Build and Speciality. You'll need to sign up though at $12.99 a month or $99 for the year, but that includes all the plans, and a custom workout editor to boot. Check out the site to make sure you have the right setup for your bike and Turbo Trainer. Training Peaks. This for me is the definitive service for planning and logging your training. It has lots of options and charts for coaches and athlete's and integrates with a ton of third parties. The service is $119 a year, and comes with a web site and apps. More importantly it also has a workout creator that can be synced to apps such as Zwift. 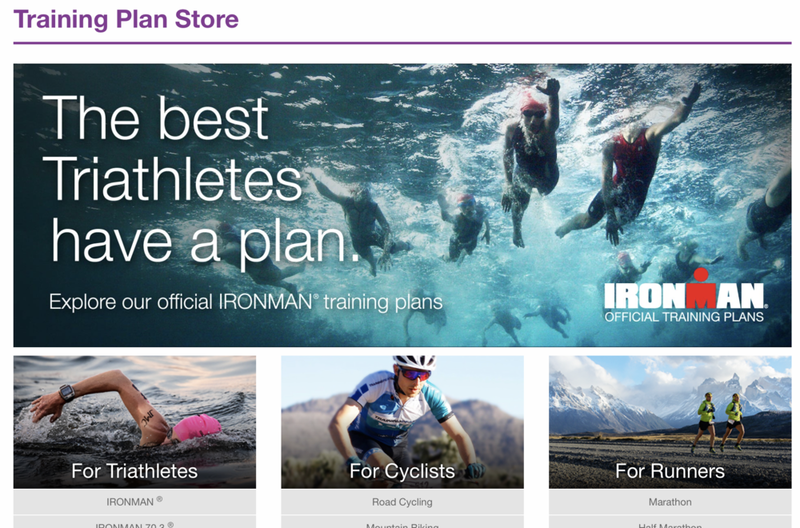 It also comes with a shop for training plans. These are not the cheapest, and can vary in quality so do some research on which are the best match for you. For free plans there are definitely some decent ones around such as these from 220Triathlon, what you may find is you need to take more time getting these into an easy to follow format on Apple Watch. This is a short summary of the apps I am currently using. This will undoubtedly change as more apps are updated and we get more features that could be useful - and I'll be writing detailed app reviews on this blog over the coming months. The Workout app is great for just getting in the pool and swimming, and it will log everything automatically for you. If Apple could only offer support for Drills (e.g. marking part of your swim as a drill so the watch doesn't try to detect which stroke you are doing, which it will struggle with when you are kicking with a board) then I think it would be perfect. If you want structured plans then you could try MySwimPro or Swim.Com which both have plans you can follow on the watch. I've not had much success with that approach - it just seems too easy to get out of sync with where the app thinks you are in the session and what you are actually doing. Instead I have taken to simple printing out the session and putting in a waterproof bag, or using the excellent waterproof plans from swimsmooth.com. I then use the swim.com app as a get in and swim option but take advantage of the easy way you can log a drill with it by scrolling the Digital Crown. With Indoor cycling I have taken to using Zwift for a few of reasons I went into here. I typically jump on the bike which is connected to a Wahoo Kickr, start Zwift on my iPhone and select the Training Peaks workout for the day (you can connect Zwift to TP on Zwift.com), put Netflix on my iPad, and AirPods in my ears and stream some mindless comedy while I go through various degrees of sweat and pain. My Apple Watch provides the HR for Zwift. Perfect and easy to setup. My wife knows when I am doing these in the archetypal "pain cave" I have created by converting a spare bedroom, because of the strange noises I make, together with the occasional swearing. It can be a battery drain on your iPhone though, so you may want to plug it in, or use one of the other options detailed in my post if that is a problem. I use iPhone rather than iPad or Apple TV simply because it's one less step to get HR from Apple Watch. Are you actually serious right now? Find an app that can connect to my PowerTap P1's and the BT HR strap and log the ride. I think this will currently mean having to take iPhone with me (until someone creates a standalone Apple Watch app that can do that). That's sort of a shame because the Apple Watch has LTE but I do typically take my phone on rides anyway, and the watch/iphone combo maximises battery life. Alternatively I may just wear Apple Watch and log a standard Outdoor Cycle Workout, and then keep my Wahoo Elemnt Bolt as a mounted bike computer to provide power data and nav. You can then combine the two files (one from Apple Watch exported as a fit file using HealthFit, and the other from the Elemnt Bolt) so you get a single file with verything in it: HR, route, speed, cadence, power. Training Peaks can combine files like this or you can use an online tool such as this one. Of course in that scenario if only Apple Watch could broadcast HR to the bolt (like a Garmin Watch can), then we could skip the whole merge step. You can use the Apple Workout app to log indoor running and it works fine and pace seems to be recorded reasonably accurately. If you want something a bit more interesting you can connect Apple Watch to the new Zwift running feature and run through a virtual world with friends - Apple Watch will provide your pace to Zwift as well as your Heart Rate. Having said that I have not had great success with the pace using Zwift, it tends to vary wildly, so test it out yourself. If you add a support footpod into the equation (I use Stryd which is a bit overkill for just pace but works nicely) then you will get better accuracy. I expect Zwift will continue to improve the Apple Watch pace support though. For structured sessions (intervals) on the treadmill I have used Seconds Pro running on my iPhone or iPad, iSmoothRun on Apple Watch/Iphone, and just manually changed the settings on the treadmill by watching the clock! Again if you want to just get your shoes on and run, then there is no greater joy than using Apple Watch series 3 LTE with AirPods (optional but sound great and stay in my ears) and the Apple Workout app. Just get out there and start running. If I need navigation or to find a route in a new area then RunGo is great for that. For structured intervals I am using iSmoothRun which is fine, and works standalone on the Watch (though doesn't seem to sync the map route to the Health app currently unless you take iPhone, even though it shows it in the iSmoothRun app and exports it from there to Strava and TP). I don't love the workout editor, but it works, and I would love an app that synced workouts directly from Training Peaks for running, but haven't found that yet. Expect an iSmoothRun review soon, and other running apps too. Apple Watch does a great job of tracking your heart rate throughout the day and exercise. I find the resting heart rate a good indicator of my form, certainly the rate increases 5 or 6 when I’m stressed, ill or overtraining. You can view it for the day on your watch directly or use the Health App on iPhone for historic data. You can get through this using the Apple Workout app though it's not ideal. The first app that is offering race day Triathlon logging is Tri Tracker from the same team who created MySwimPro. I haven't tried this in earnest yet, so look out for a review coming soon. For longer events you are going to need to consider battery life - see my analysis here for options. Of course for the event you will almost certainly be wearing a transponder from the organisers who will be logging your swim/bike/run and transition times and I know some athletes who feel this is enough for race day, and means there is less distraction on the day. Personally I like to see the data during the event so I know how far behind I am from what I expected (surely I can run a 5:30 marathon in an IronMan, I mean how hard can it be? And according to Best Bike Split a sub 6hr bike is easy - I’m really going to fly round that Maastricht course), and so I can agonise and relive the experience by pouring over the figures later. Doesn't IronMan Ban Smart Watches for the Race? Official IronMan branded events are quite strict in their rules, and I have sometimes heard quoted that simply “no smart watches are allowed”. This isn’t quite true - according to section 5.02 (c) (iii), “Athletes may not use communication devices of any type, including but not limited to cell phones, smart watches...” in “any distractive manner during the Race” where distractive manner means “making and receiving phone calls, sending and receiving text messages, playing music, using social media, taking photographs, and mounting the device to a bike for purposes of using the device like a bike computer”. The mounting bit is sort of strange, and may be worth clarifying at a specific event since rules can change for them, however you won’t need navigation help during an event so wrist worn is typically fine, and as long as you are only logging and viewing data, there shouldn’t be an issue (just don’t count on getting iMessages from a coach or supporters (“Hurry up Ian! Best Bike Split had you as finished the bike about an hour ago- what’s up? Shall I meet you at the corner with some energy gels? Do you need a push up that climb?” I actually saw a runner ahead of me during the Maastricht IronMan receive a huge juicy burger which he greedily bit into from one supporter at about 30k in, definitely not allowed, though how he ate it is beyond me, I could hardly swallow water). Other organisers are nowhere near as strict as IronMan and often differentiate themselves with a more friendly relaxed approach, so do check the rules and regs for yours. RunGap and HealthFit are the current best options for this. RunGap is more expensive, slightly more complex, and has a few more options. HealthFit is quicker, simpler, rock solid and cheaper - and tends to be my first choice every day. This may seem like a bit of hassle getting the apps together and everything in line so they are how you like it, and you may think it's just easier to use a Garmin or Suunto dedicated watch instead. That could certainly be true for some people, but I am perfectly happy using Apple Watch now, and have made the move from being a "two watch type of chap" as I was at the start of this blog. Recent technical issues with Suunto have also highlighted the benefit of having a Watch that doesn't rely on the cloud to log anything, so Apple Watch wins there too. Apple Watch is now a huge financial and commercial success for Apple, and the biggest watch business of any type on the planet, and it is only going to get better - can you imagine what they will be doing with it in a few more iterations? Expect a new Apple Watch version every year in Sept by the way...Apple are relentless in that approach and others will struggle to keep up in my opinion. If you are going to use Apple Watch for your first or next Triathlon, I would love to know how you are getting on in the comments below!